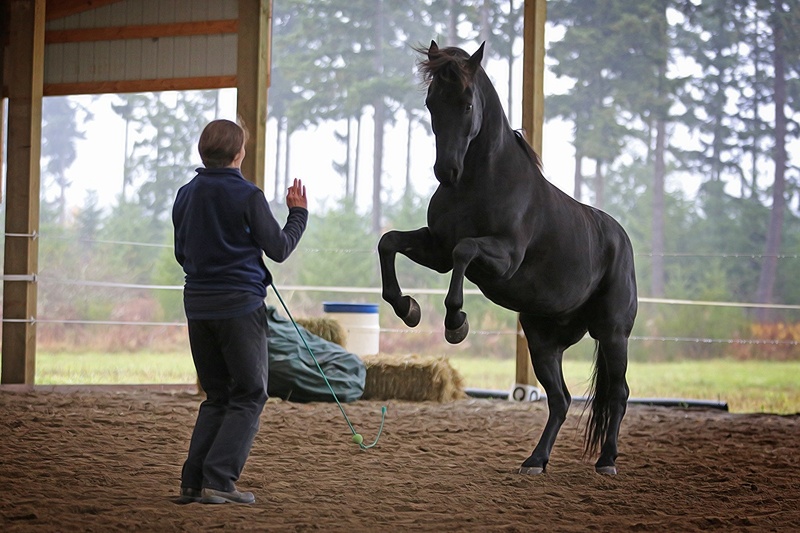 Clicker training is a way of marking positive behaviors through positive training, first described by Karen Pryor in her books for dogs and then applied to horses. It is important to note that clicker training only moderately creates a human-animal bond. It is not nearly as powerful in the horse’s mind for bond-creation as herd dynamics or liberty horse training, but it is nonetheless extremely helpful to mark or develop or shape behavior. Combining liberty horse training where the horse is free to get away any time and clicker training is very powerful. Georgia Bruce has a great step by step way of clicker training horses and I just applied elements of liberty and trick training to her technique. I spent a few days with Ivy Schexnayder and that really helped me shape some of my tricks (see the Trick Training page). The technique is simple: at the moment the horse does something you want to reinforce or highlight, you click and then give him a treat. This way he learns to associate the sound of the clicker with his favorite food! The tricky part is to build upon previous training to finally shape the behavior you want. The other tricky part can be timing and people always worry about that to the extent that they do not try clicker training and would rather use their voice. Using your voice is great unless you want to mark a very fast behavior, say teaching the rear to a horse. If you reward a moment too fast, he may think you want him to come down instead of stay up in a rear. By the time you say, “Good boy” the whole thing is done and you might have missed your opportunity. Clicker training was essential when teaching Mick to put a halter on. He had never been touched nor did he want to sign up for restraint. In this video you can see the step by step process of teaching him to halter using the clicker. In the videos below, you can see that Mick is still wild enough, he rejects the halter. Many people leave a halter permanently on their horse because of this problem (which is not as safe for the horse). So here I use clicker training, careful to separate the treats in a pan from me, to mark the point at which he says it’s okay to have a rope around his neck. Note in my second attempt, I wait too long before clicking and he rejects me but we make up a bit in the end. Of course now, I not only halter him but I ride him on the trails alone. He is only 3 years old.